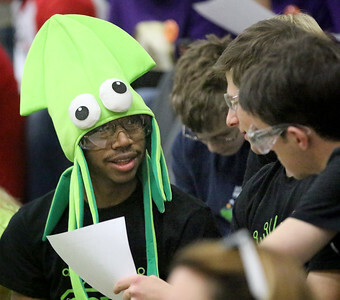 Matthew Apgar - mapgar@shawmedia.com Tats Daniel of Crystal Lake, 18, left, wears an octopus-shaped hat as he talks with his Octopi teammates on during a FIRST Robotics competition on Saturday, Feb. 13, 2016 at McHenry County College in Crystal Lake. Matthew Apgar - mapgar@shawmedia.com From left: Fruit Salad team members Skylar Wickbrsty, 14, Kristen Anderson, 15, and Audrey Godsell, 16, pass the time as they await their turn to compete during a FIRST Robotics competition on Saturday, Feb. 13, 2016 at McHenry County College in Crystal Lake. 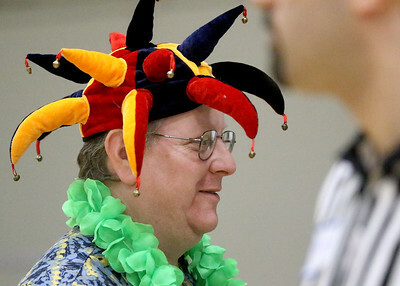 Matthew Apgar - mapgar@shawmedia.com FIRST Robotics competition emcee Tim Koons of Rockford livens up the competition on Saturday, Feb. 13, 2016 at McHenry County College in Crystal Lake. 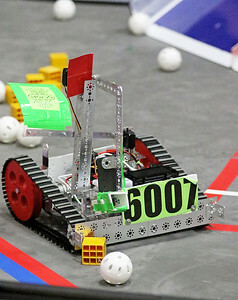 Matthew Apgar - mapgar@shawmedia.com A robot operated by Team Octopi members Nick Baietto, Zach Clewell, and Jacob Anderson, all 17 and from Crystal Lake, collects round and cube objects for points during a FIRST Robotics competition on Saturday, Feb. 13, 2016 at McHenry County College in Crystal Lake. 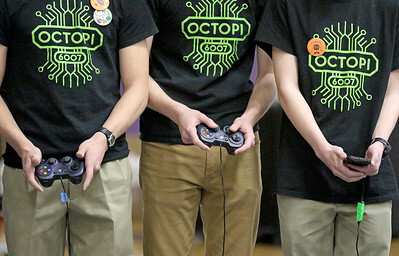 Matthew Apgar - mapgar@shawmedia.com Team Octopi members Nick Baietto, Zach Clewell, and Jacob Anderson, all 17 and from Crystal Lake, control their robot during a FIRST Robotics competition on Saturday, Feb. 13, 2016 at McHenry County College in Crystal Lake. Team Octopi members Nick Baietto, Zach Clewell, and Jacob Anderson, all 17 and from Crystal Lake, control their robot during a FIRST Robotics competition on Saturday, Feb. 13, 2016 at McHenry County College in Crystal Lake.